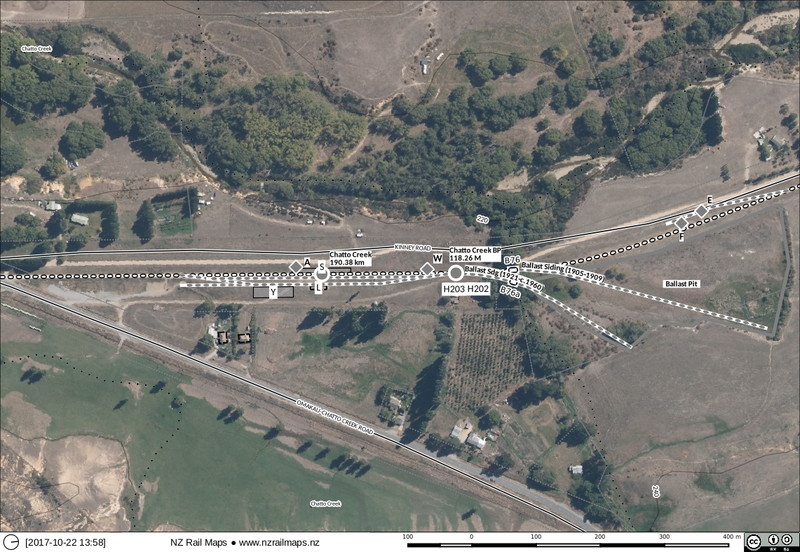 As part of the public release of maps in stages for the Otago Central line, I have about 2 weeks to get maps of the section from Alexandra to Cromwell completed. 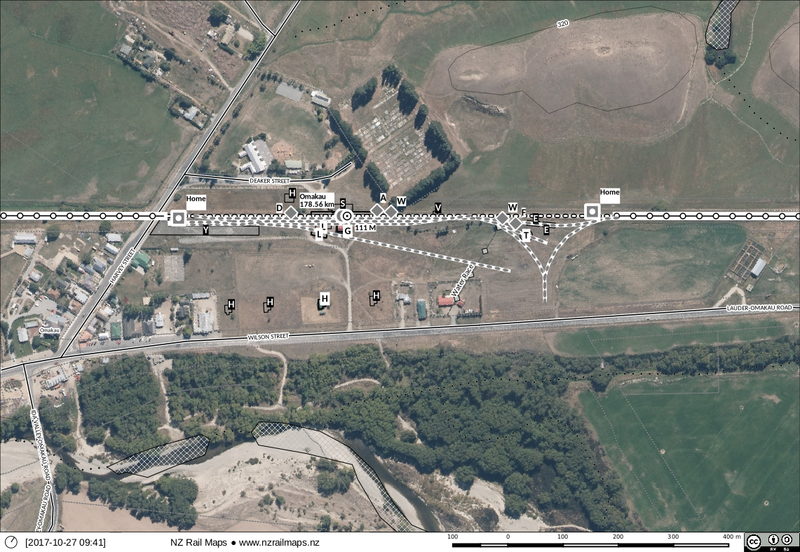 The most complex section because of the large number of changes which need to be shown as snapshots on the maps is from Alexandra to the second Clyde terminus. 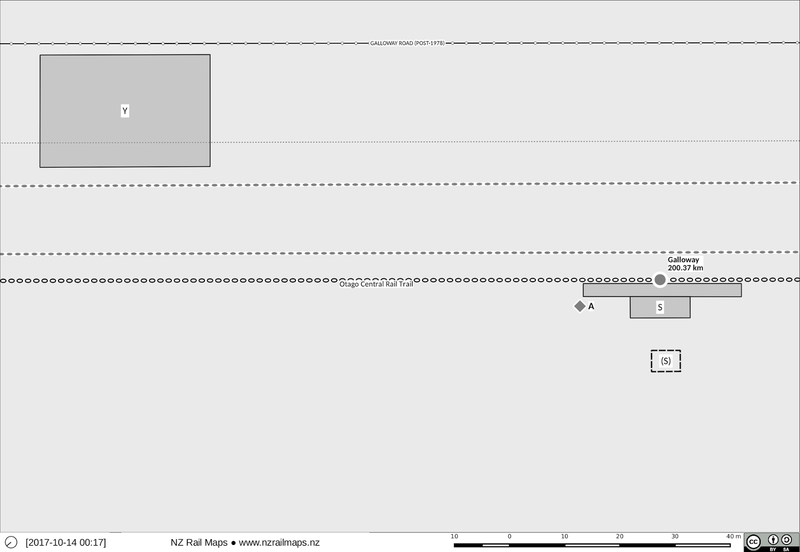 Rendering maps is a slow process because you always find mistakes which have to be corrected, and in the case of these snapshots, there is a fair amount of chopping and changing to get the right detail displayed. By playing with filters and other mechanisms I can depict the changes fairly accurately by causing different features on the map to appear or disappear at will. Here are the snapshots for the easternmost part of Clyde yard where the MOW had its depot during the Clyde Dam construction project. 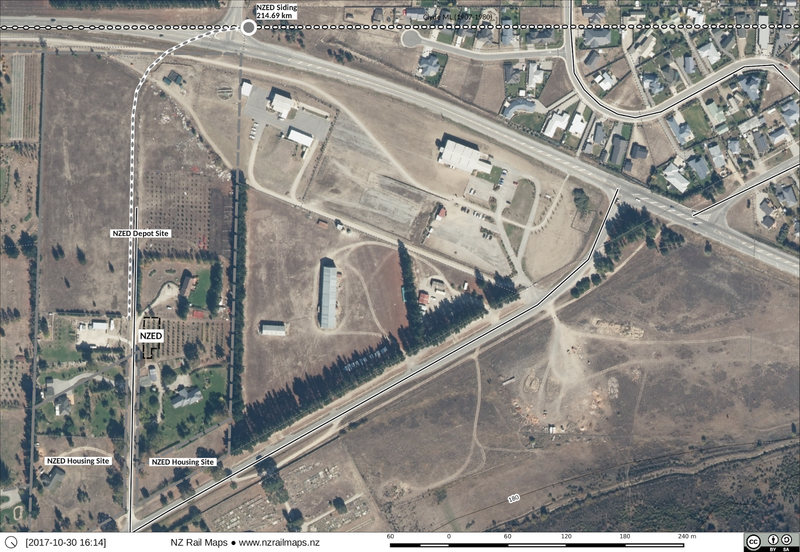 The upper overlay shows where the main line originally ran for more than 70 years (suggested date 1977), while the lower tile shows the changes that happened when the new Clyde railhead was built and the main line was diverted (suggested date 1980). In 1967 the railway ran in the same location that it had been for the preceding 60 years, and the area geographically east of it seen in the lower half of this picture was all open fields; it had not been developed for any particular purpose. In 1968 the NZED (New Zealand Electricity Division, a government department responsible for electricity production) established a depot in Clyde. The original purpose was connected with the construction of a high voltage power line to the Tiwai Point Aluminium Smelter. However, the site remained in place for the duration of the Clyde Dam construction project and must have been used for works for this project also. NZED had staff housing located next to the depot site. 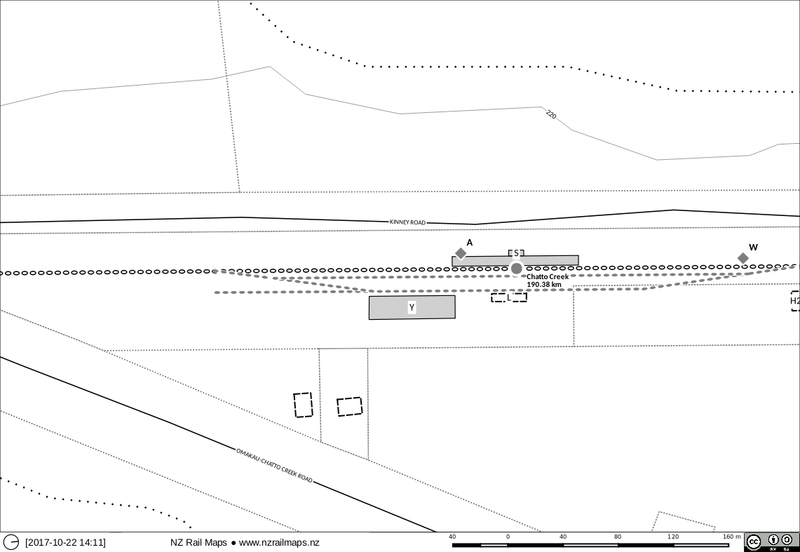 The depot had its own railway siding off the Otago Central Railway. NZED's siding was closed and removed in the late 1970s when the new railhead and alteration of the railway was planned to take place at Clyde. A part of their site was taken for the new railway yard. 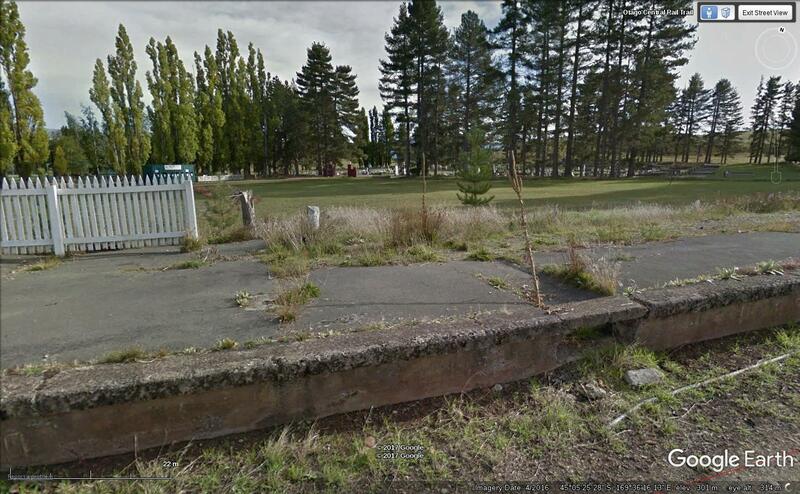 They probably used the adjacent MOW siding when that site was opened for the Clyde Dam project. 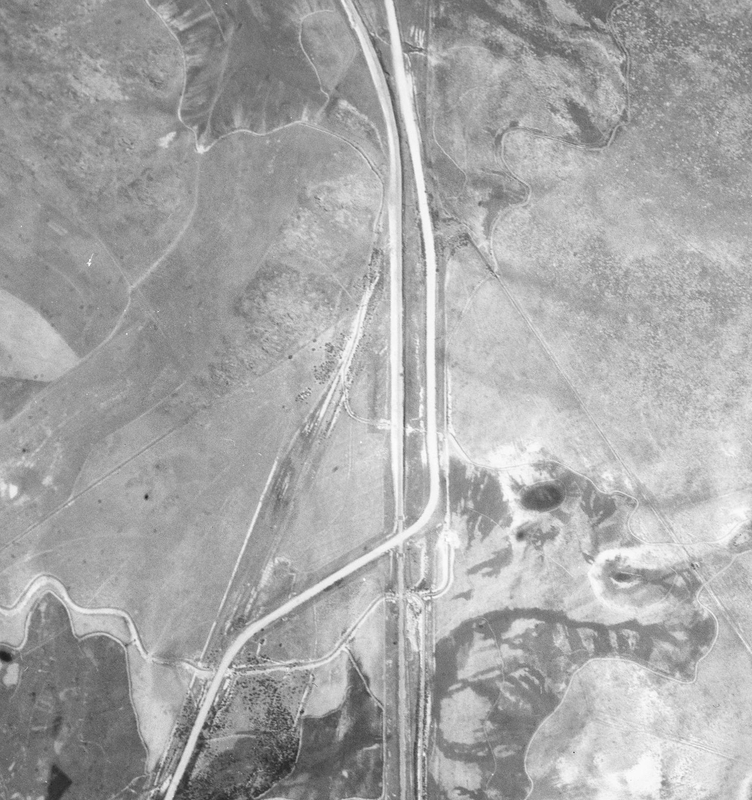 In 1979 the date of this snapshot, the main line to Cromwell had been deviated to allow the new highway to be built on the railway route, and the new alignment was temporarily connected to the old as shown at upper left. In 1980 the new Clyde railhead was opened. The old line to Cromwell was disconnected and lifted. 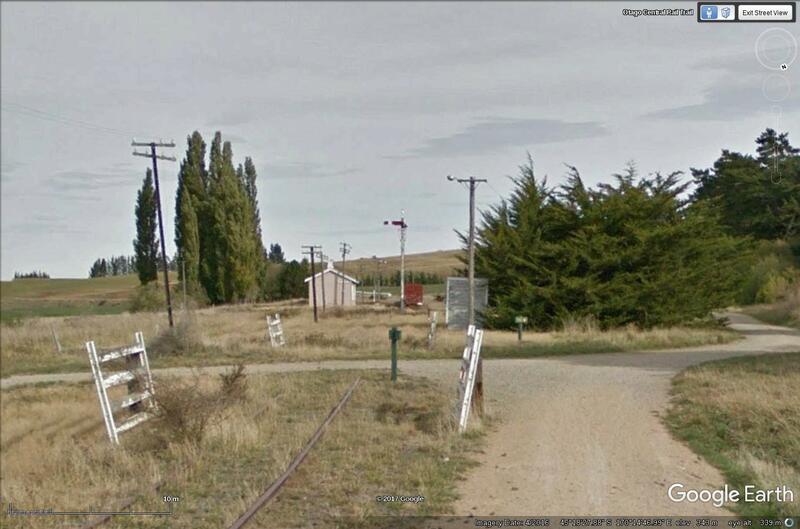 After the Otago Central Railway was closed the Clyde yard was eventually handed over to DOC as part of the rail trail. 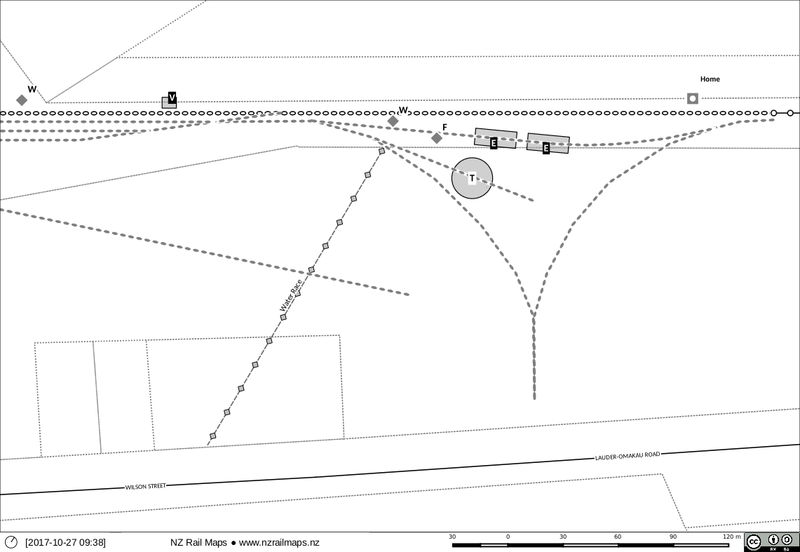 This map shows how the site is used at the present day. A pedestrian/cycle underpass has been installed under the main highway in the last couple of years. OpenStreetMaps whilst being a free online map platform is not suitable for this project because it does not allow historical features to be marked on their maps. 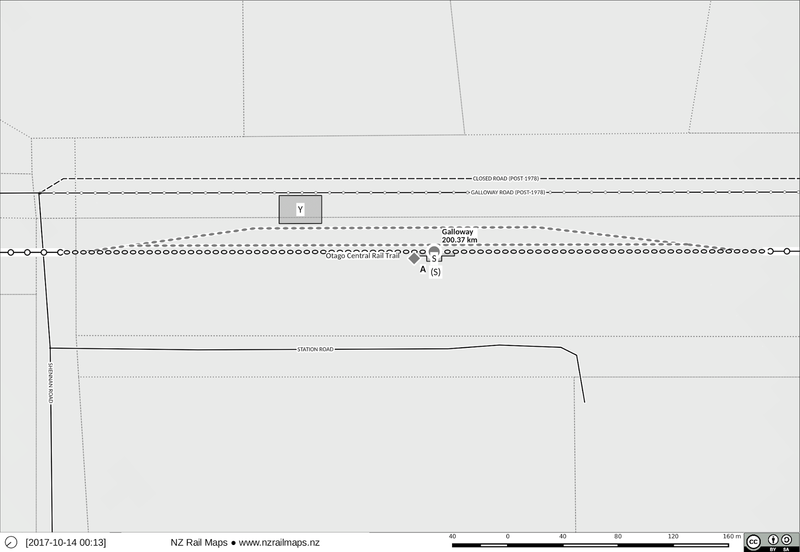 Wikimapia allows historical places to be marked, but not corridors. 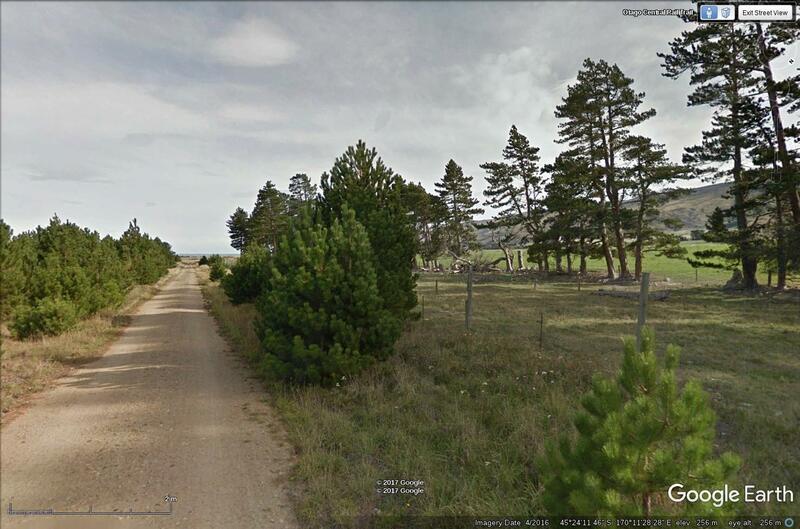 A third alternative is to provide map files than can be used with Google Earth or Google Maps. 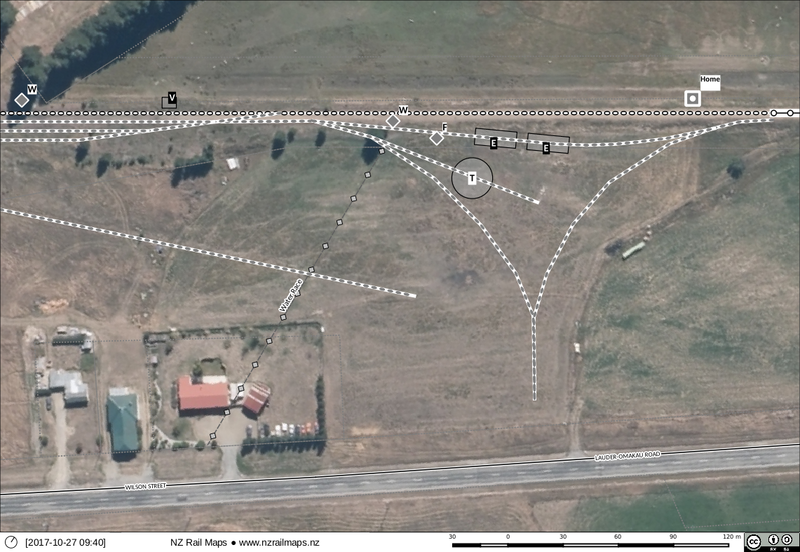 A variation of this is to publish a set of Google maps for the overall project. Providing GPX files that can be loaded into a hand held GPS for navigational purposes is also an option. 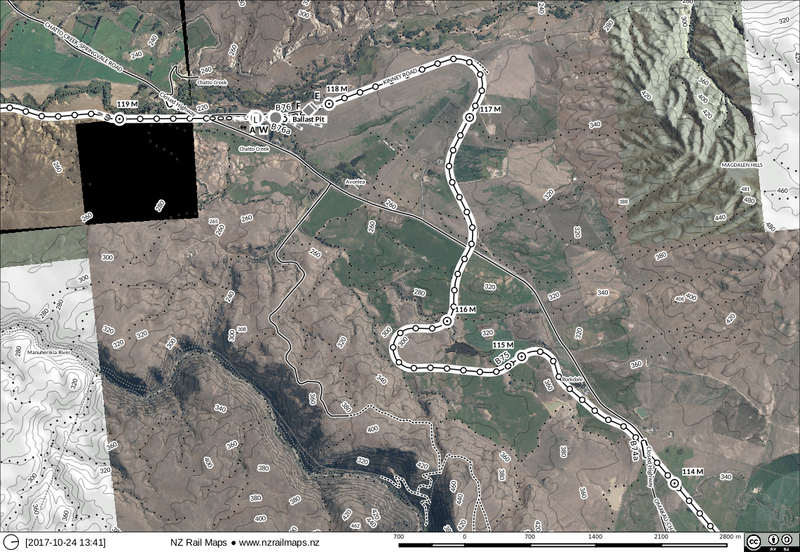 As this project winds on, I think publishing a basic set of maps on Google Maps is likely to be a viable scenario. This will probably combine with producing KML and GPX files. When this project first started everything was in KML files. This option was abandoned to produce the present GIS based mapping. This doesn't mean I am planning to go back to producing the KML files with everything in them as I did in the past. It simply means it is reasonably viable to export some of the corridors and locations that are in the GIS, into KML files that can be made available for download. The best download option is still being considered but it is possible this could either be Google Drive, Google Maps or the project's own website. Converting KMLs into GPXs is probably an automated step that can be further considered. Alternatively Google provides an option to export maps from Google Maps to KML. Adding the locations of historical stations into Wikimapia is an option I will consider, but as they have to be marked manually, it may well be a low priority option. I have decided to keep going with station diagrams for the time being but it will be a busy time with writing Part 2 and finishing off the maps needed for Part 1 so we will see how that goes. 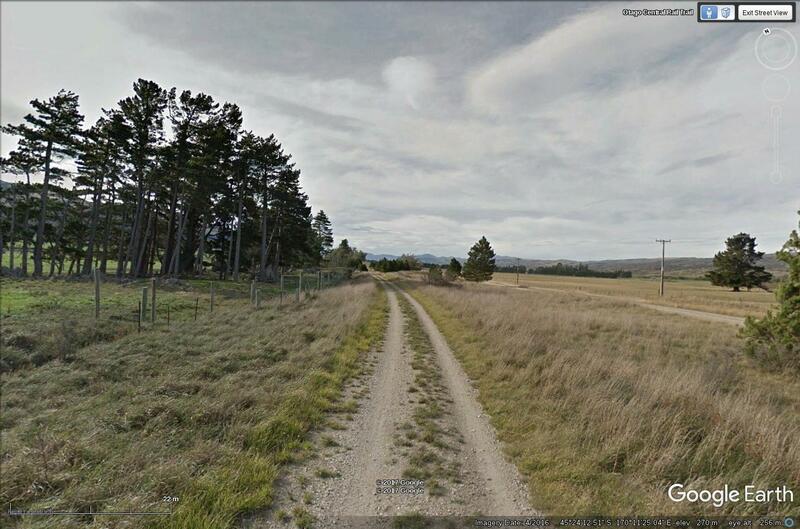 Omakau is the next station, followed by Lauder, Auripo, Ida Valley, Oturehua, Wedderburn and then Ranfurly to bring Part 2 to completion. It is more the case of having all the detail to hand to fill in Part 2 which looks like it will be appropriately divided at Ranfurly, and then a couple of months later Part 3 will cover the remainder back to Wingatui, although I don't have as much detail about the line before 25 miles because I don't have the chainage charts for that part at present. 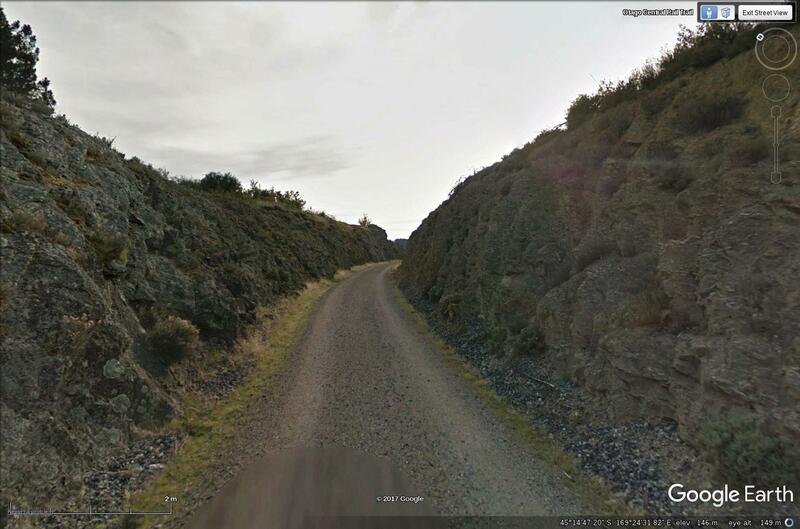 Between Omakau and Chatto Creek on the Otago Central Railway the principal geographical feature of the railway is a climb out of Omakau to the top of the Tiger Hill, via which the line then descends to Chatto Creek. Tiger Hill is noted for its sweeping horseshoe curves which take the line 180 degrees one way and then back the other way to carry on in more or less the same direction as the early part of the descent. Chatto Creek is more or less at the foot of this steeply graded 1 in 50 section which is about 6 km long according to the curve and gradient diagrams (which I will place online sometime soon). 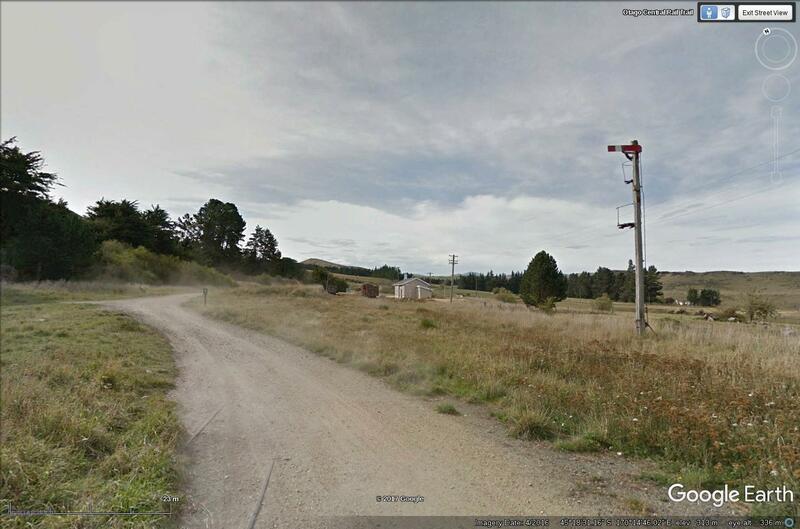 The top of Tiger Hill is marked by what was originally a level crossing just past the 114 mile peg. Because the original crossing of the road would have been over a cutting when the railway went through, the road was altered to make a level crossing nearby. The overbridge No. 74a was built in 1964 and straightened the road up. 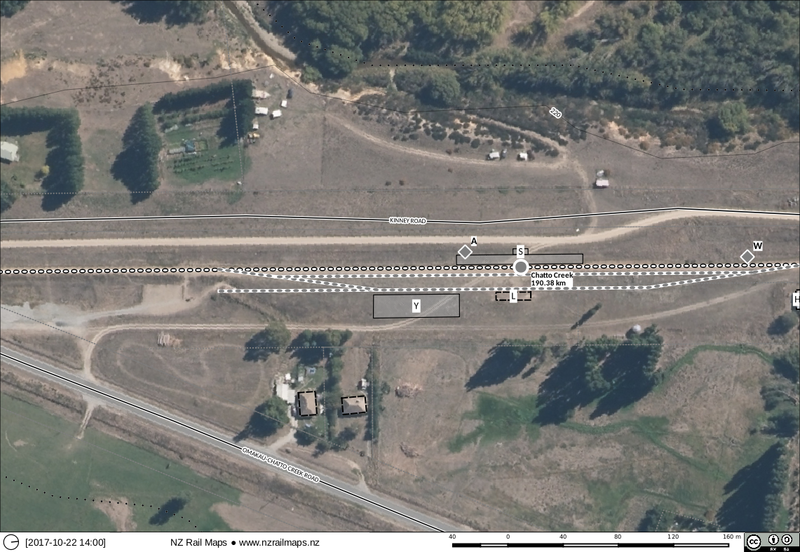 As there are many level crossings on the Otago Central railway it must have been desirable to have this overbridge installed, perhaps because of problems with visibility at the level crossing, however it is also possible realigning the highway was a significant impetus. There were in fact several overbridges built for the line and some of the others have previously been looked at and like this one we will revisit them with the aerial photography coverage that is available similar to that published below. Overview of Tiger Hill. 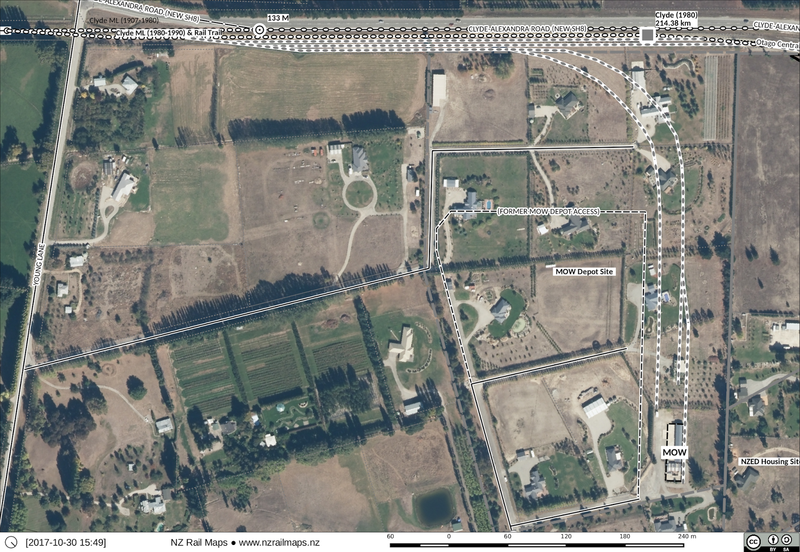 Chatto Creek station is upper centre, and Bridge 74a is lower right. Bridge 74a at the top of Tiger Hill, also showing the former road route. 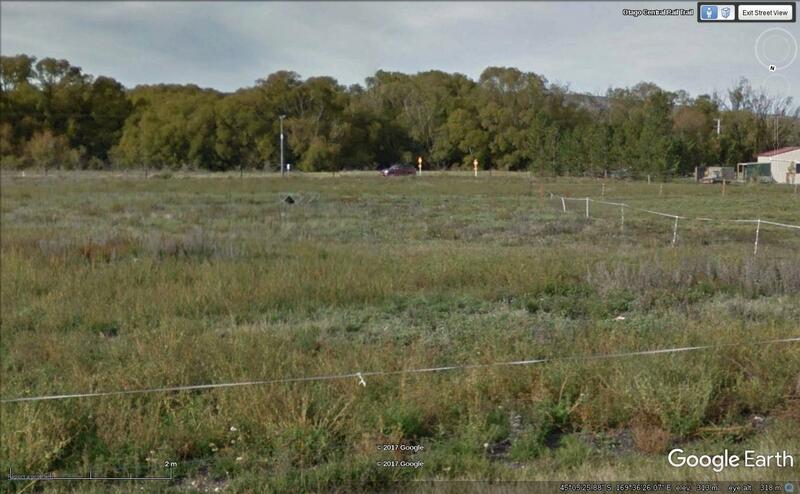 These days there is no trace of the former level crossing on the ground. 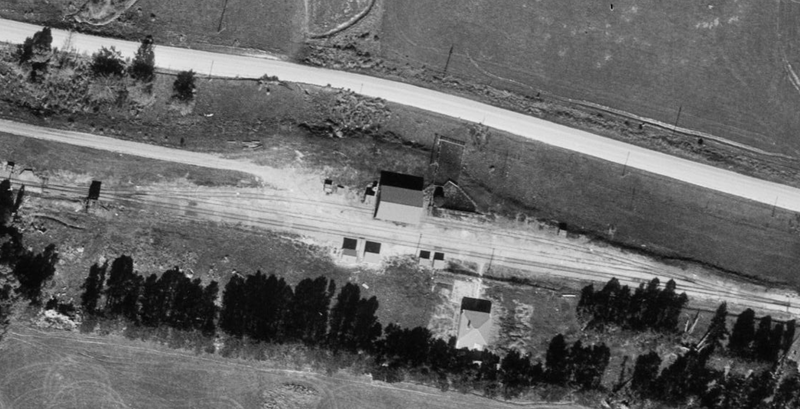 A 1938 aerial photo showing the level crossing. 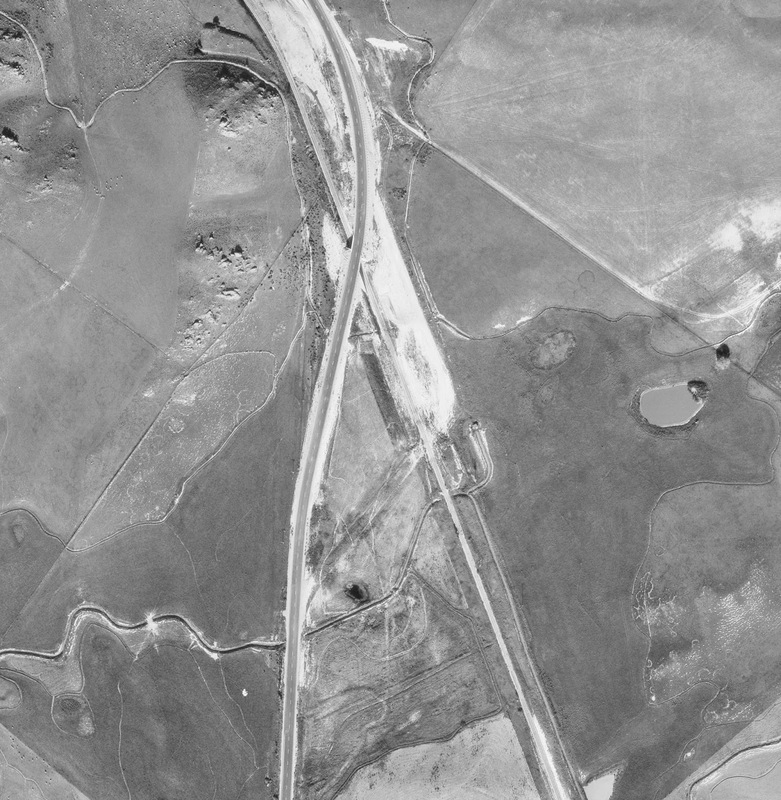 The bridge in 1965 a year after completion, and the old road and crossing clearly visible. From the highway as it is today, the old road probably went through the where the gate is on the right. The old road as seen from the current highway bridge heading towards the level crossing. Site of the level crossing on the ground. When I wrote my last post part of it was about the difficulty of getting good quality aerial imagery of some places. 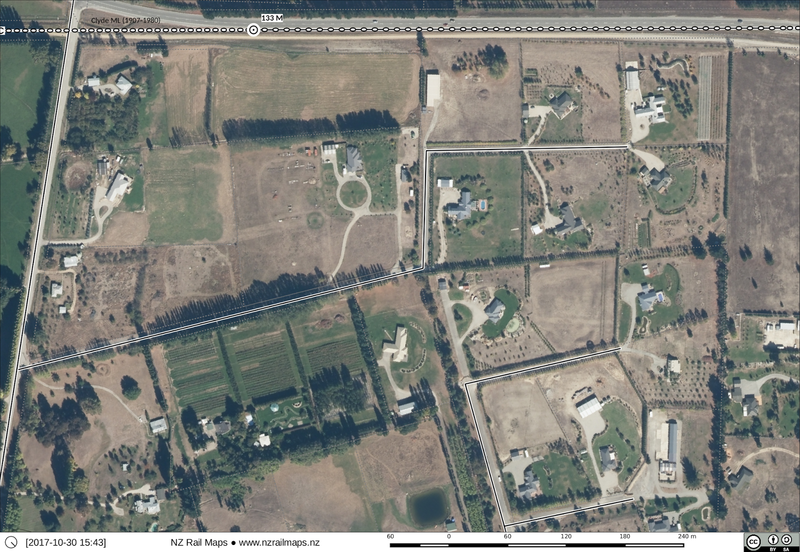 A bit of lateral thinking along with resurrecting the Linz aerial footprints layer has helped me obtain more quality aerial imagery of a few places, although the part of Alexandra covering the Fulton Hogan siding still eludes me but there are several surveys from the 1980s that don't yet appear in Retrolens as well as plans in Archives NZ Dunedin so I will somehow get on top of that one, one way or the other. What I have managed to get hold of is 1956 and 1965 high resolution coverage of Chatto Creek and I expect to be able to find more coverage of other areas as well but I was not able to get 1960s coverage of Galloway although I did get partial coverage of Alexandra from 1956. The key has been the realisation that the survey footprints are in some cases way off and using the footprints layer to get surveys that are close to our area of interest means I can position the Retrolens map to the centre of those footprints and then get the maps off them that way, but the one of Galloway turned out to be tantalisingly close but just not close enough. I have filed a ticket with Retrolens asking if we can have a survey number search because of the problem of having to know how to position their map to get the images for the surveys. 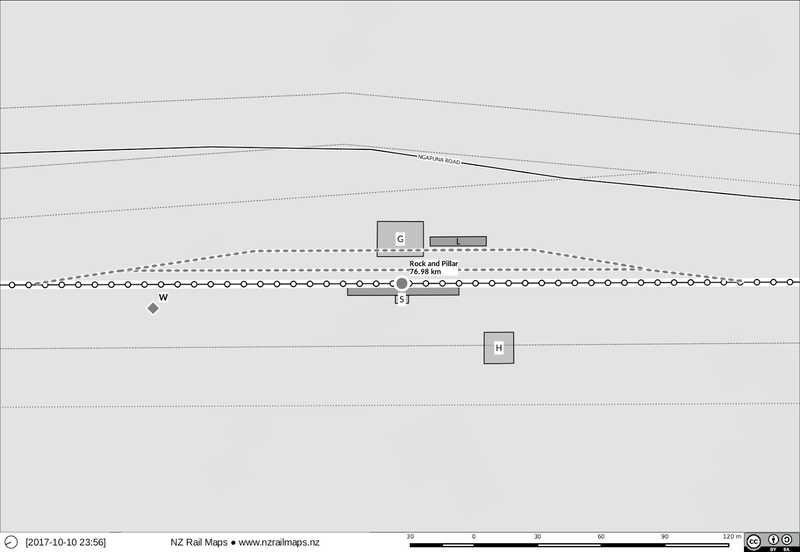 Apart from that at the moment this will be the last yard diagram for a while as the priority is cleaning up Alexandra-Cromwell ahead of an article being published in a month from now, and looking at those maps and having put samples into the Google Plus NZRM Volume 12 collection there are a few little details needing to be tidied up to get them ready for release so that along with writing part 2 (Alexandra-Ranfurly) is the priority for now and I don't need to draw all the diagrams right now to write the article but I do need to have them finished when that article gets published in January. So they will come through later. If you use the tag cloud at the bottom of each page of this blog you will see a new tag Volume 12 has popped up and has 64 articles tagged with it at the time of writing this, so articles in the blog will be tagged with their map volume number and this means there will be another link from the website to this blog using that tag, and over time every article in the blog will have a tag, some articles may be tagged KeysData instead of a volume if they aren't volume specific. Just to reiterate Volume 12 not only covers the Otago Central but also includes the Kingston Branch and its branches but I have no idea at this stage when the Kingston stuff will be added to Volume 12. At some point not too long ago I did start drafting a map book for Volume 12 and this will be resurrected but possibly the first edition might only be the Central, but once the Central is completed it may well be the case that Kingston will be added fairly quickly in order to get the whole volume put together fairly quickly. So there will be work happening on that fairly soon as well. One of the key aspects of those major stations is that none of them ever closed except when their section of line was closed. Another is they all had engine depot facilities for periods of their life. There are lots of criteria that could be used. So everything else is a minor station and Chatto Creek is a minor station. So in that album it will be added as a minor station with the aerials and maps. Two houses lower left. These were not present in 1938 but had appeared by 1956. 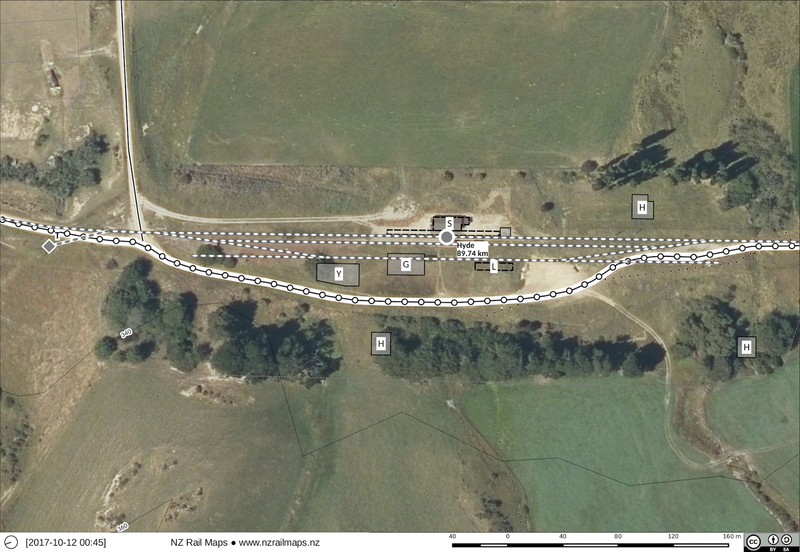 The houses appear to be aligned to true north and are a state house type of pattern that is often seen in railway housing that was built after the period in which NZR stopped building their own houses. It's not conclusive these are railway houses hence lack of label but it is quite likely but I would have to do more research to understand why they were needed at this time as they are not the only houses there. The backshunt off the end of the siding. This is shown from the chainage charts but is not visible in the 1938 aerial photo which indicates to me it may have been lifted by that stage assuming it actually did exist to begin with. Water vat at the north end was there from the beginning and important in the steam era but later removed. 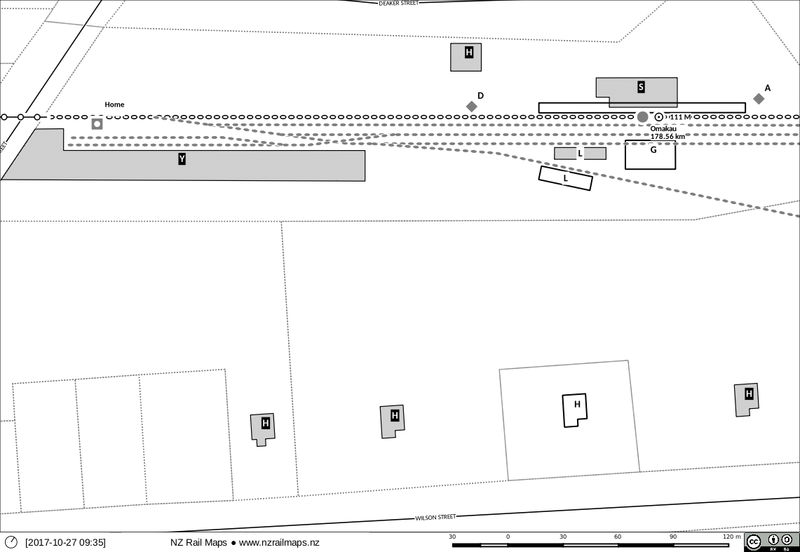 The two houses H203 and H202 which are both shown in a 1938 plan of the ballast pit and the aerial photo from that year, as well as the chainage charts. House 202 was later removed (sometime between 1956 and 1965) and its function might well have been taken by one of the houses shown in the south end map. Ballast pit and sidings. 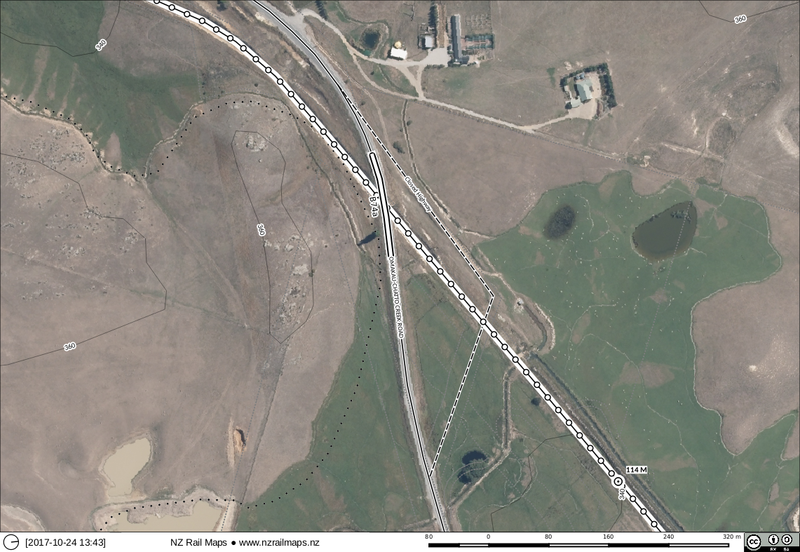 The original siding dated from the construction era and came off the main line to the north end (at 118.22 miles, which will be probably be added to the map) of Bridge 76 and went into what was a smaller pit at the time, the exact extent of which is not confirmed and the actual position of the siding needs to be marked as approximate. This was a construction era siding that was removed once the next pit along the line or a permanent pit was established somewhere else as there were many temporary pits used only for construction. Opposite the pit is the old construction era engine shed siding that went off at 118.02 miles which will be added to the map. Whether there was a turntable with this isn't clear, nothing is marked. The second ballast pit siding came about with the reopening of the pit for general use from 1921 to about 1960. Since 1921 was about the time the line was completed there must have been a need to establish this as a source of permanent ballast for line maintenance. 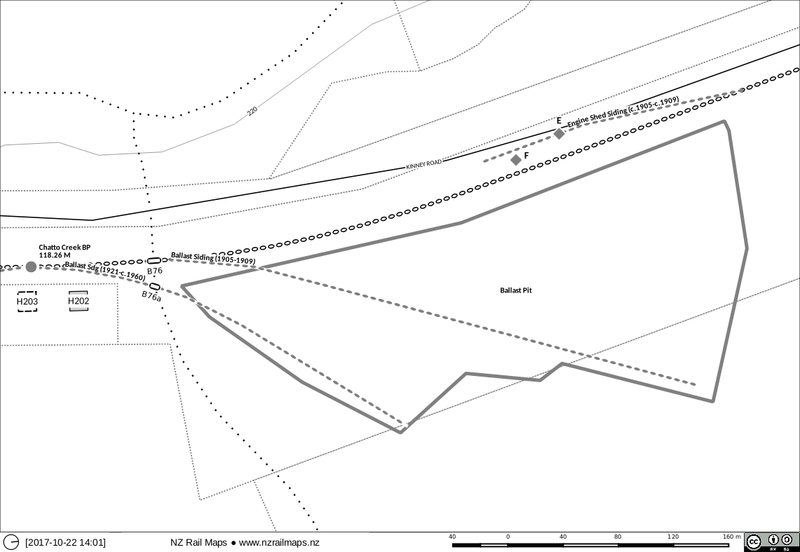 The other major pits were at Doigs, Ngapuna and Hyde, with the Ngapuna pit being closed when Hyde was opened. Hyde closed in the 1950s, and Doigs and Chatto Creek pits both closed in the 1960s approximately so there must have been other pits outside Central that were available for a ballast source. 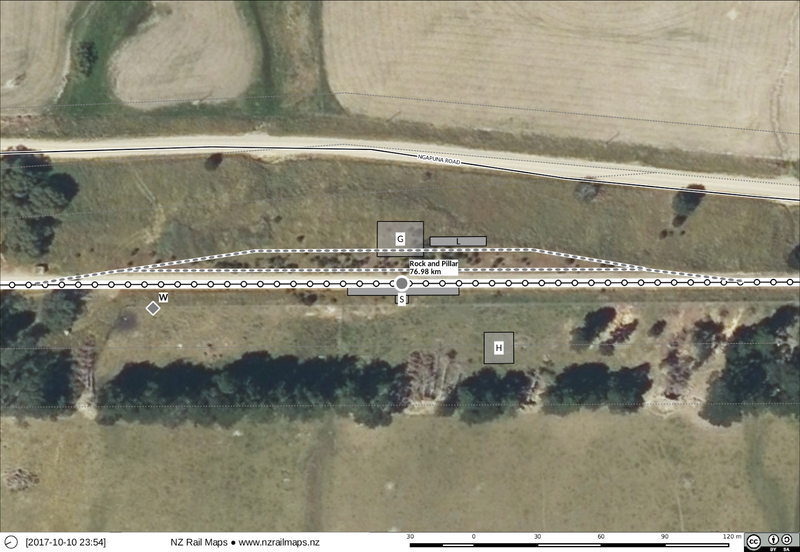 The second ballast siding needed its own bridge alongside the existing mainline bridge and its route can be plotted accurately from the 1938 chainage chart diagram and the aerial photo of that year. 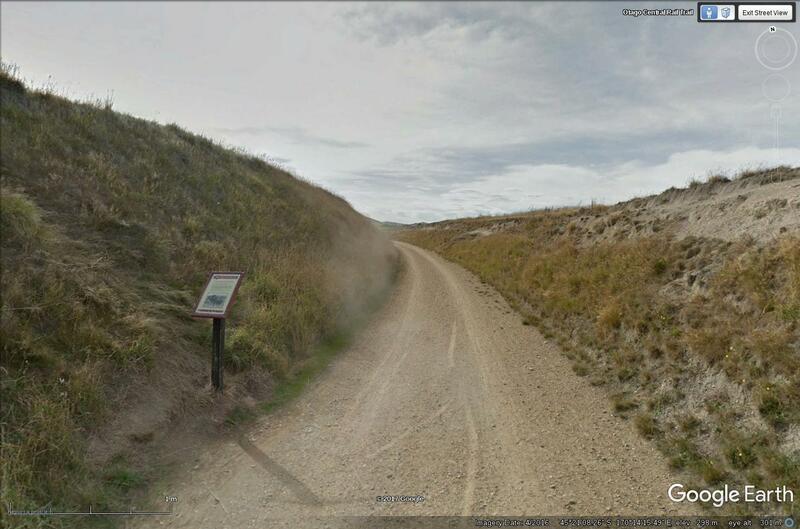 Well things have been a bit slow lately with the whole maps project, not just the Otago Central part of it. When I look over previous months particularly August when the SNL and Nelson maps were being put together quite rapidly, it's pretty obvious that in September and October I haven't been able to give the project as much attention as I have been accustomed to before now. The reason for this is the need to attend to some other areas of my life and doing some background stuff like setting up the website, which has occupied a lot of effort in the last two weeks in particular. This has been around designing the website and therefore putting together the individual pages with a text editor and FTP server, and setting up and structuring the different online resources that the website links to. So far we have stuff in Volume 12 (Otago Central) and Volume 7 (Nelson) despite the fact that in the past I have posted a lot of stuff in the previous Flickr site. It is simply the case at present that I would prefer to post final versions of everything rather than interim, so the old content won't be going straight back up. So alone of all the stations in the rail trail area, Ida Valley is the only one we cannot get an aerial photo for when it was open. 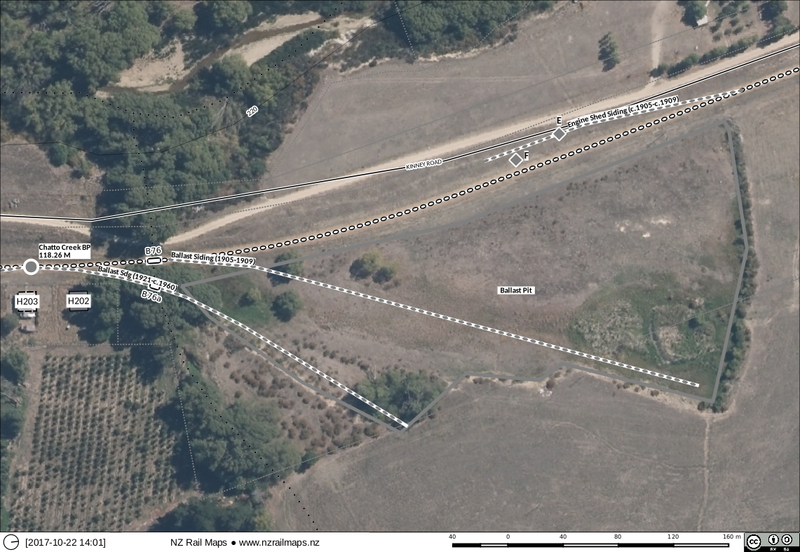 Also most of the stations on the Taieri Gorge Railway have the same limitation, there is almost no good quality coverage of the Taieri Gorge that would allow nearly any of the stations there to be detailed. I am continuing to try to find more maps of the various areas and also taking a look at the list of surveys that I have from Linz to see if there is stuff that has not yet been scanned that I can possibly get put into the queue. 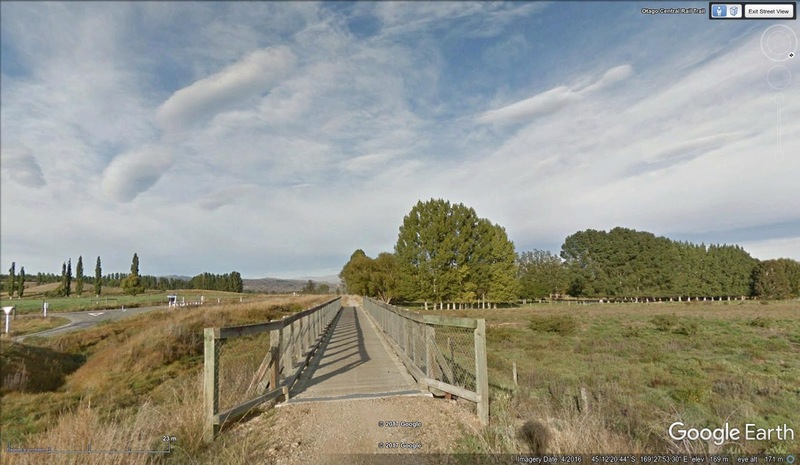 So next up will be Chatto Creek. And alongside all that I will be writing part 2 of an article series. Part 1 of which is supposedly being published next month. Well I have started working from the other end of the line backwards because it makes a lot more sense seeing that is the direction I am working in for an article I am writing at the moment. 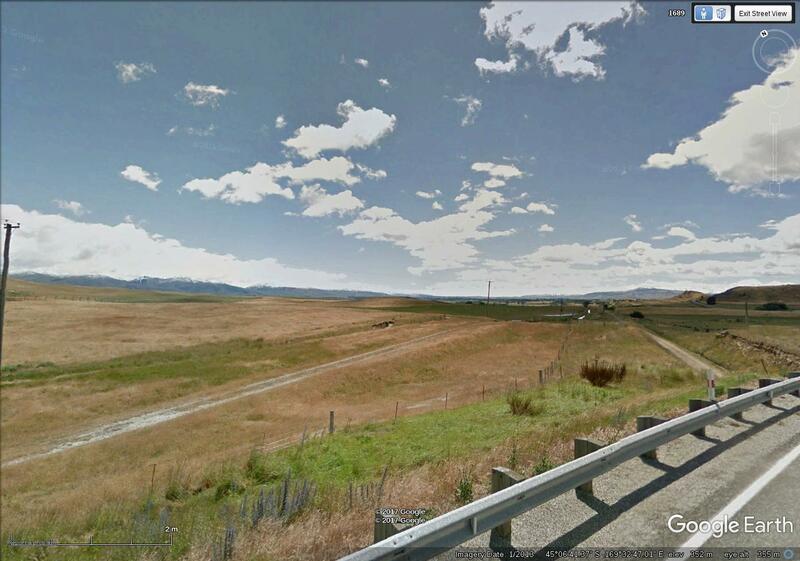 So having already covered Cromwell to Alexandra then it is working back from Alexandra to somewhere, maybe to Hyde. 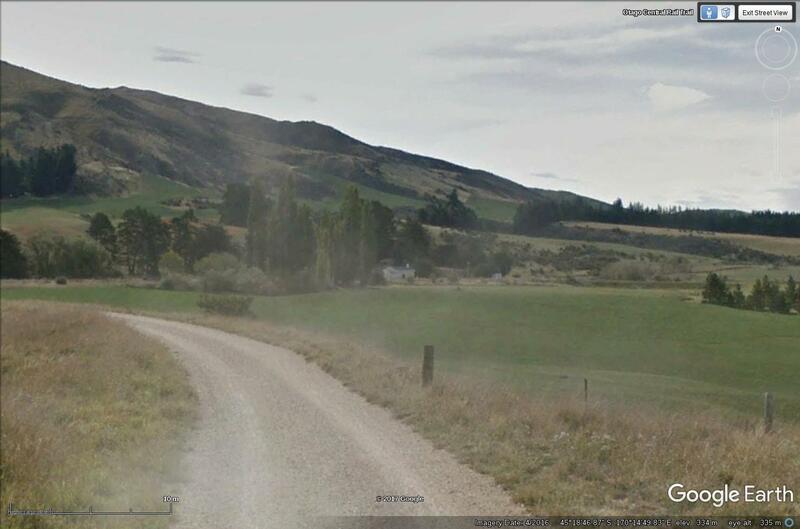 If we take the distance from Alexandra back to Wingatui and split it in half, we end up somewhere near Hyde. But I have to work out how much I can do with an article of 3000 words and how much will be left for the remaining part. And that has to be finished in four weeks. It won't take too long to do the maps seeing as I have already drafted a lot of them, just comparisons and corrections from the aerial photos is what is needed. 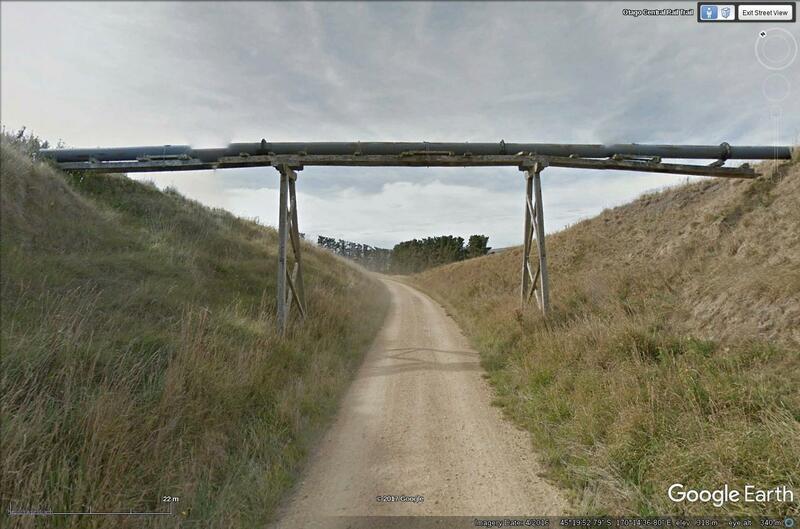 Galloway was at 200.37 km between Chatto Creek and Alexandra. It was never a big station and like a lot of others never had a separate goods shed, instead the station building (like many of them) catered for the limited freight. There was a stockyard. The road was originally diverted to go around the site, but since closure has been straightened, cutting through the edge of the stockyard. The station building was partially preserved on the Clare family farm nearby, and sold to the Rail Trail Trust when they moved away from the area. A not too sharp aerial photo of Galloway from a 1976 aerial of the area. The track layout on the maps was aided by the chainage charts showing centres of 13' and 39' for the loop and siding respectively. It is not clear if the loop was still in place in this view two years before closure. Along the foot of some bluffs at 205 km, west of Galloway. One of several large rock cuttings between Galloway and Alexandra. Bridge 79 about 1 km east of Galloway. This is 41 metres long. The Manorburn bridge (No.81) between Galloway and Alexandra. This is 55 metres long, and only 3 metres high. 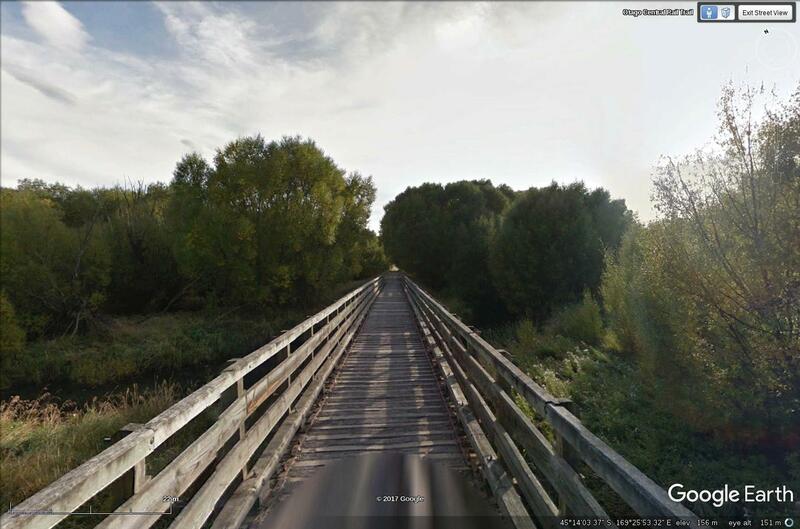 The bridge was originally constructed at a length of 121 yards, but half at the Galloway end was filled in with an embankment when it was rebuilt in 1944. 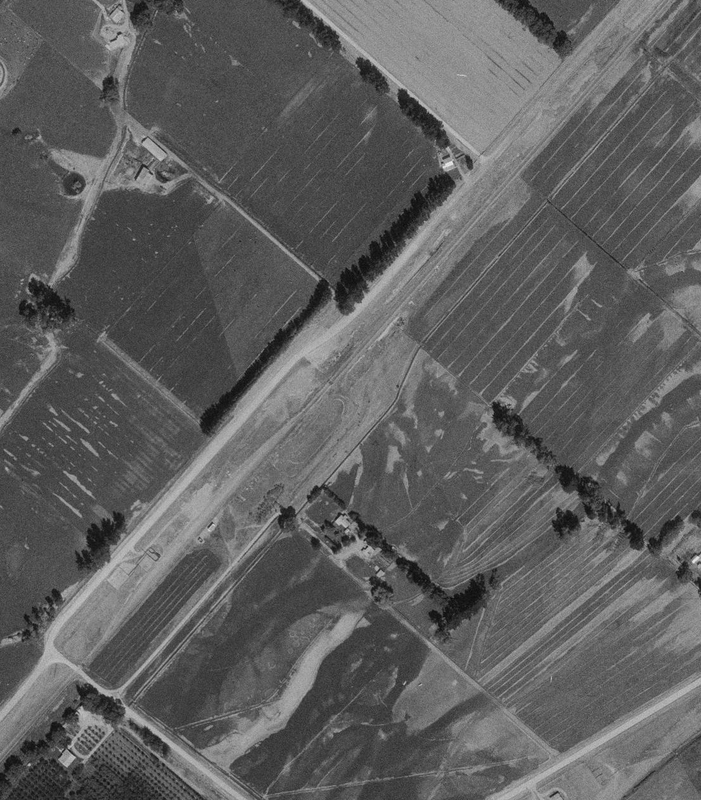 Hyde from the 1966 aerial photo of the area. Hyde. 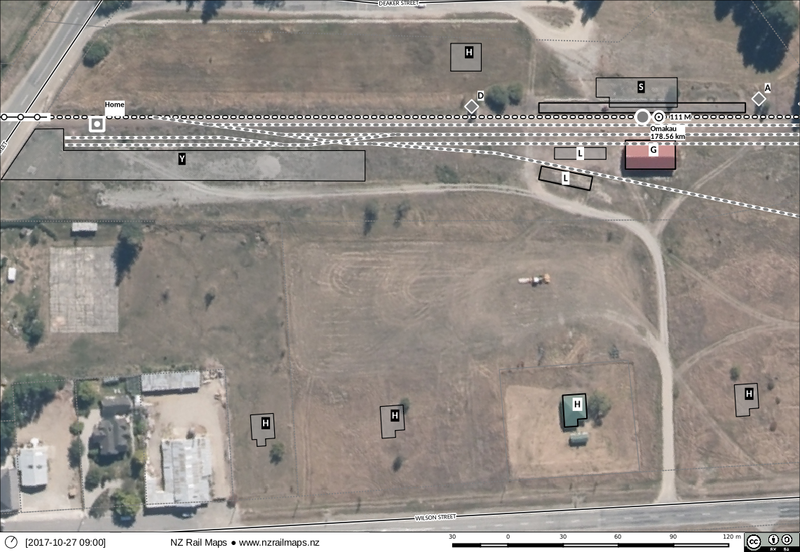 The only structures remaining are the station building, platform and loading bank. The yard was purchased privately from NZR when the line closed and therefore remains more or less as it was except for the buildings that have been removed. 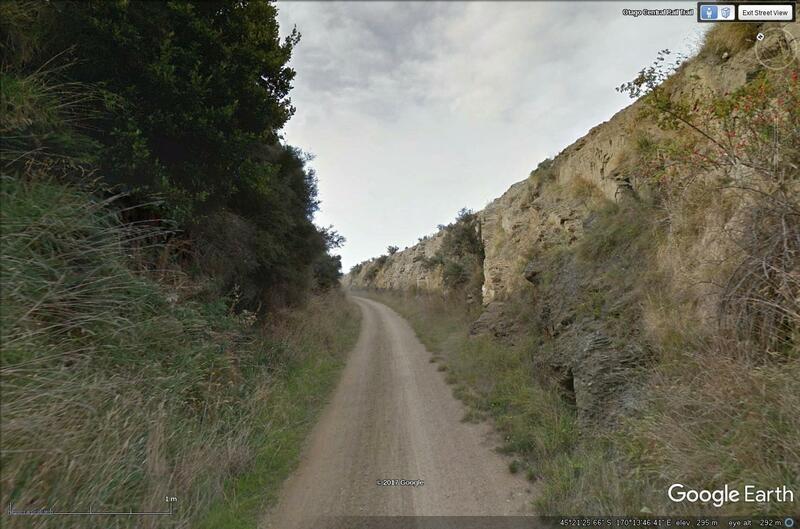 A long and deep cutting at 83 km, a few km south of Hyde. One of the most substantial cuttings on the rail trail. Looking across Bridge 50 crossing Five Mile Creek. 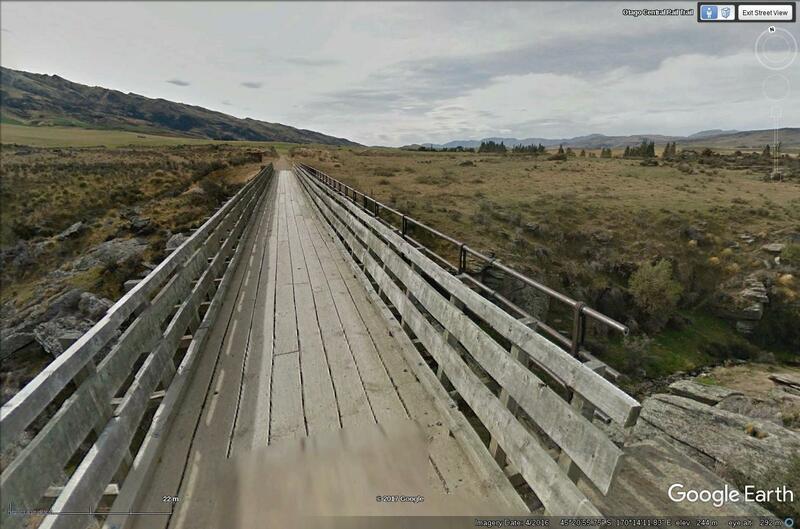 This is the most substantial bridge between Hyde and Middlemarch with a length of 52 metres and a height of 12 metres. Note the original style handrail on the right. The north end of Hyde. Hyde from the south. 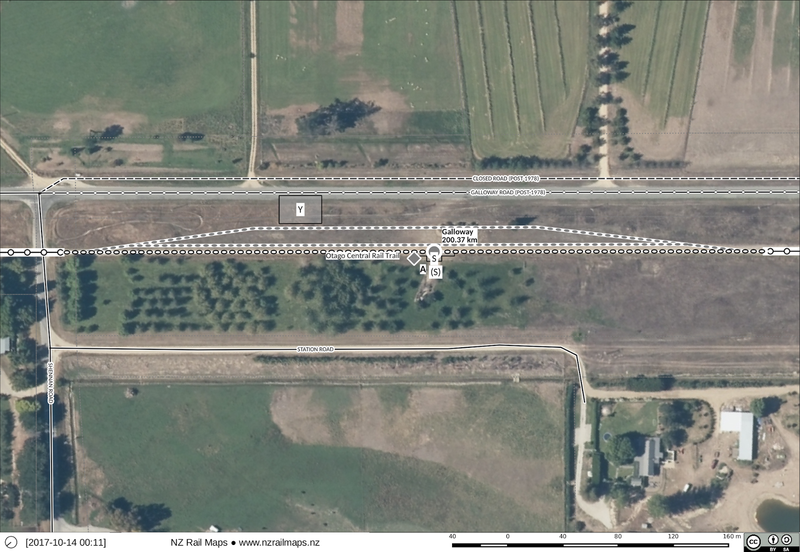 The rail trail at the time followed the access road at the west side of the yard, with an extension to cross over a backshunt as seen in the bottom of the picture and join the trail to the south. With the purchase of the Hyde station and yard by the rail trail trust the trail has been altered to pass next to the station. Looking around the big curve just south of Hyde with the station building middle distance. One of two pipe crossings near Hyde. "Straw Cutting", where the Hyde rail disaster took place in 1943. Hyde accident memorial, 500 metres south of the actual location. Work on the OCR maps in general has been going pretty slowly of late, as have a lot of other things. I hope to get back up to speed pretty soon because I have to do some more article writing over the next few weeks. 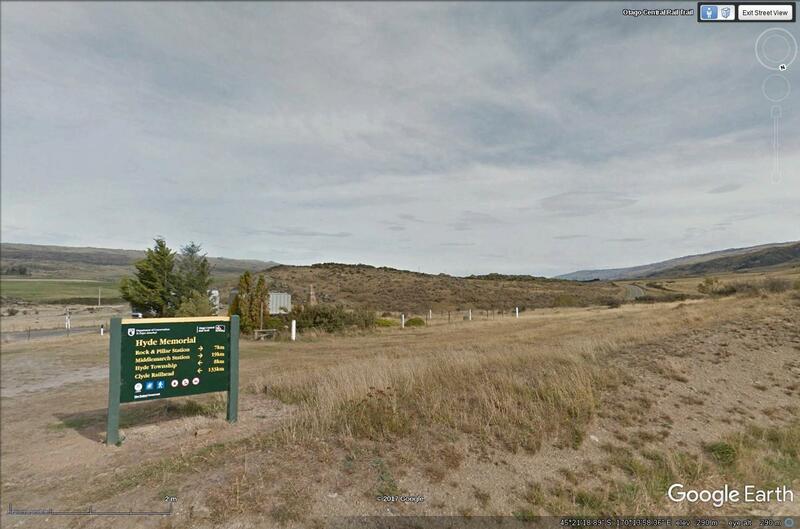 Rock and Pillar is the second station up from Middlemarch on what is now the Rail Trail. 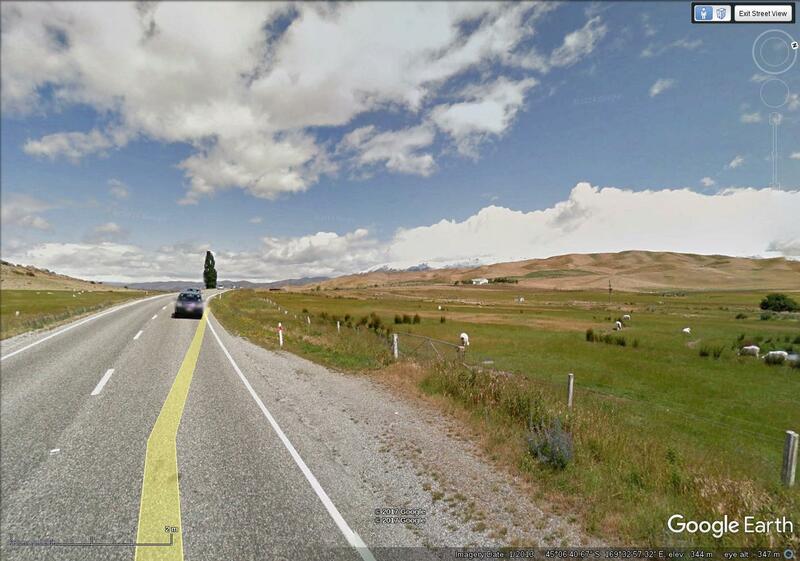 It is located at the intersection of State Highway 87 and Ngapuna Road. 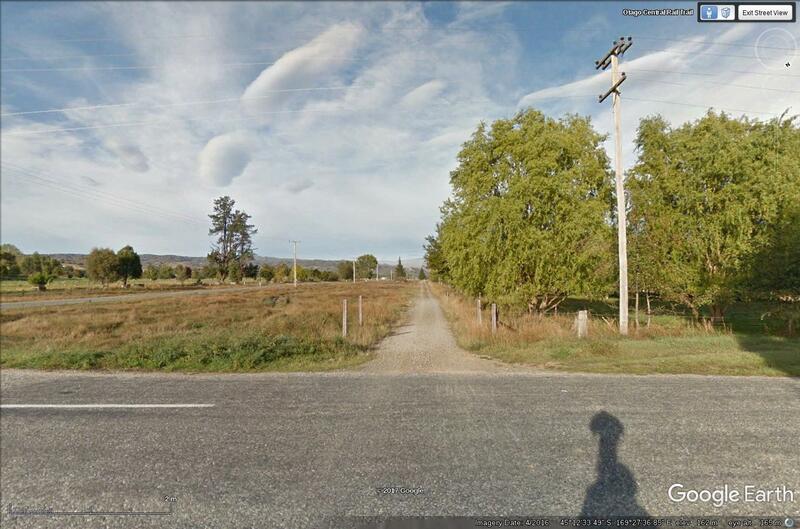 As with Ngapuna, the latter road passing directly in front of the station was in fact SH87 until at least 1978. 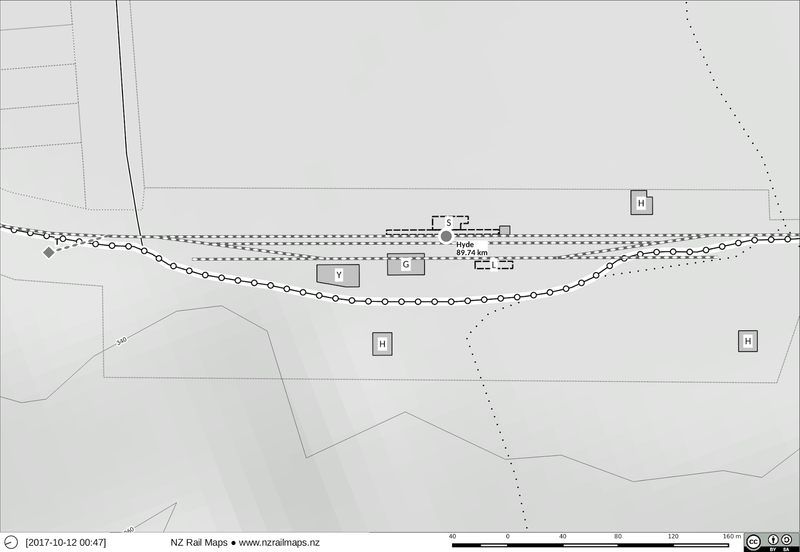 Maps of Rock and Pillar, the lower one overlaid over current aerial photography from Linz. Streetview image of Rock and Pillar from the south. 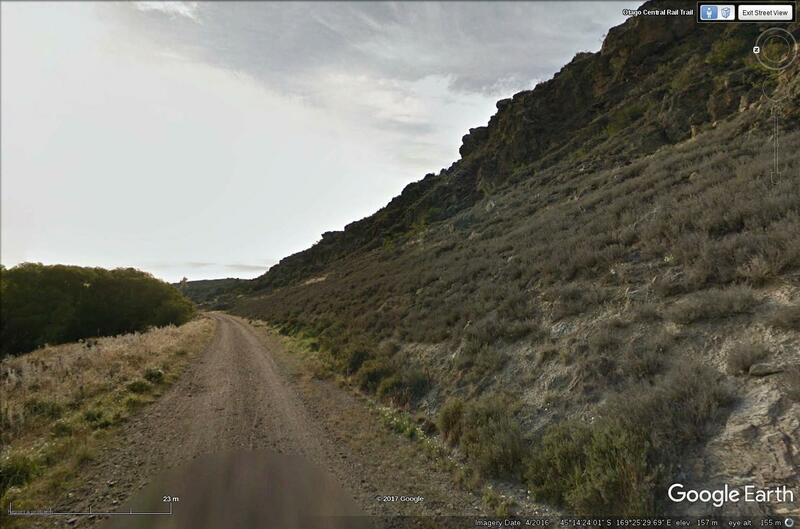 Streetview image of Rock and Pillar from the north. 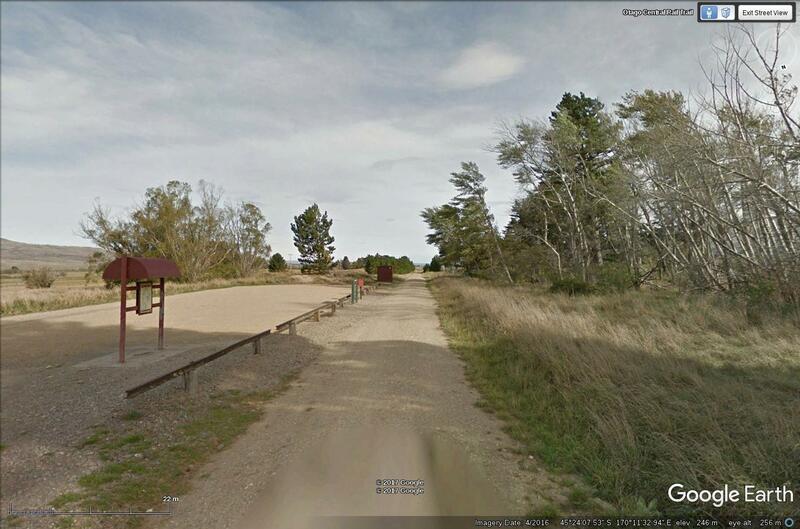 The carpark and other structures have been added by the Rail Trail trust. 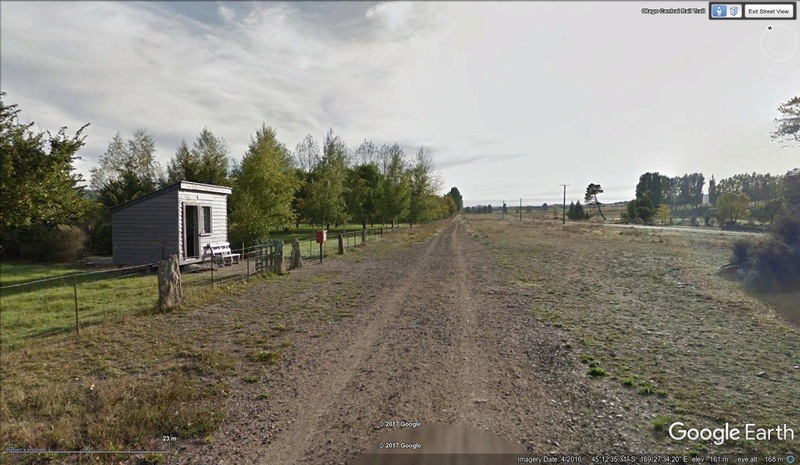 The points off the main line to the loop and siding were just beyond the little red hut. 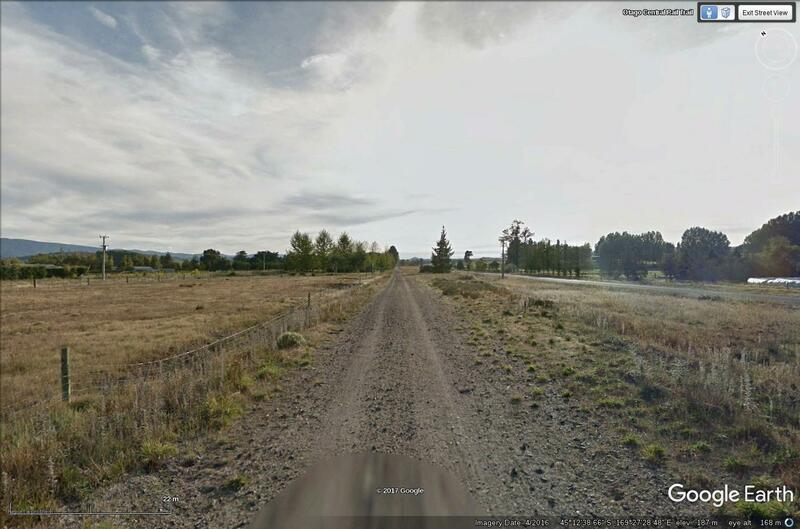 This streetview is similar to the photo on page 77 of "Over the Garden Wall" 3rd edition. 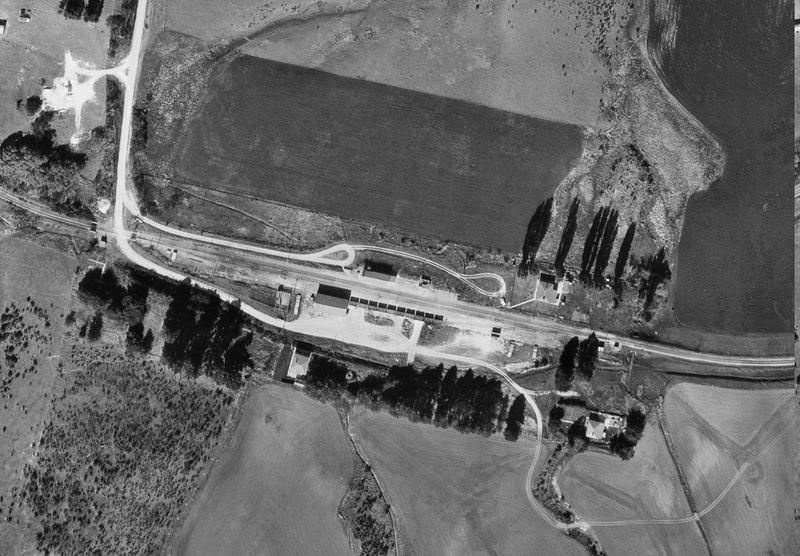 As the 1966 aerial shows, Rock and Pillar had a single house just behind the station platform. The station closed in 1981 and all buildings and other structures were removed, leaving virtually no trace today. 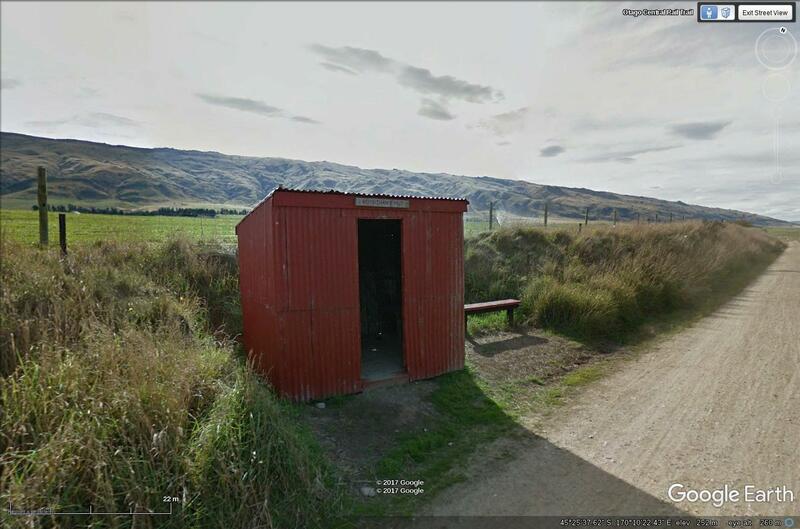 Like many of the red sheds on the trail, "Moynihan's Hut" may not be original, or in an original location. 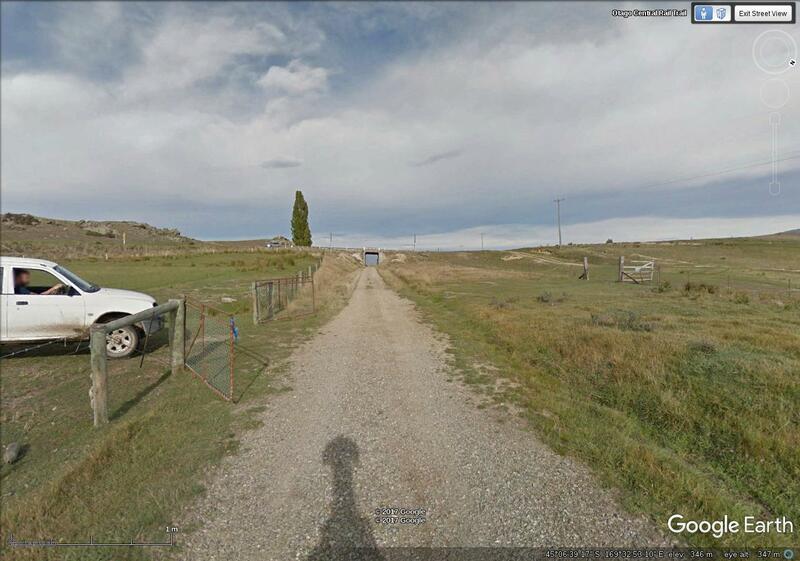 It is situated about 1.2 km north of Moynihans Lane near bridge 42 and the 46 mile peg, between Ngapuna and Rock and Pillar (approx 73.6 km).